We were already in the neighborhood, and since SYB had seemed sad about missing out on the Afghani feast a week and a half ago, we decided to take a break from all the architecture tours to enjoy a leisurely tea at Bamiyan. We ordered what were, in my opinion, the “greatest hits” of that night’s dinner: a steaming, fragrant pot of Shir-Chay (the traditional Afghan tea brewed with milk, sugar, cardamom and rose petals) and two varieties of hot, crispy turnovers: the Kadu (pumpkin) and the Boulanee (scallions), accompanied by the delicious tangy yogurt mint sauce. Perfect. 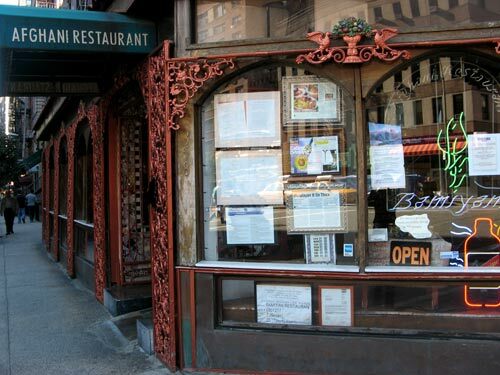 From the restaurant, we caught a bus uptown, along the route from which we would part: he, home to prepare the food for tonight’s dinner party; me, home… to relax before heading to tonight’s dinner party. On the M5, we were struck by a sudden inspiration. One of the security guards at the Chrysler Building earlier that afternoon had highly recommended we try to check out the rooftop gardens at Rockefeller Center — one of the rare opportunities to wander the meticulously landscaped oasis atop the British Empire Building, normally closed to the public. 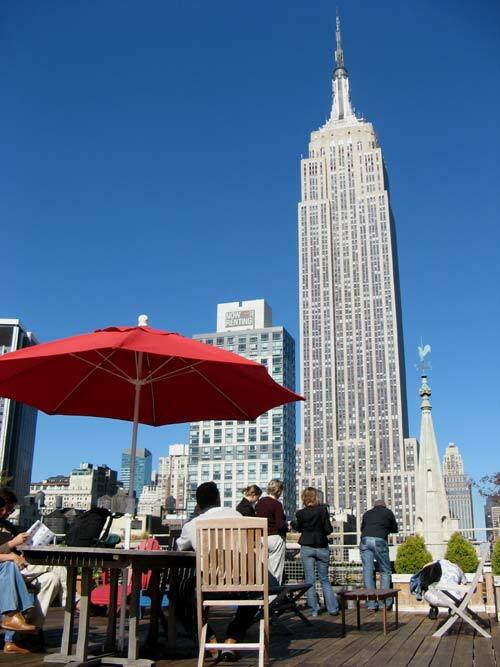 The space features a topiary garden, a reflecting pool and dramatic views of St. Patrick’s Cathedral. At the time, we didn’t have any plans to be in that neighborhood, but as our bus crawled its way up Sixth Avenue towards 50th Street, we thought: Why not? Well, for one: the site was scheduled to close at 4:00PM, and a quick glance at SYB’s watch informed us that it was at that moment, in fact, 4:00PM. We exited the bus, and raced east towards Fifth Avenue along tourist-clogged 50th Street. Or rather: attempted to race, as best we could without resorting to full body-checking of complete strangers. (“Welcome to New York. Now… move!”) By the time we made it to 620 Fifth Avenue, it was 4:10PM. Would the lobby guard let us upstairs, just for a peek? Please? Since we were already in the plaza, it gave us the chance to check out Sky Mirror, the latest public art installation by internationally renowned British artist Anish Kapoor. The exhibition, unveiled in Rockefeller Center on September 19, was organized by the New York-based nonprofit Public Art Fund and hosted by Tishman Speyer. 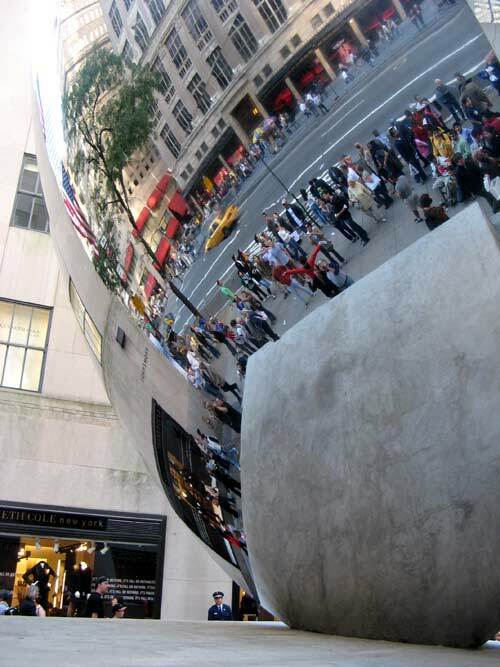 The 23-ton, 35-foot-diameter curved seamless mirror was made (in Finland) of highly polished stainless steel; it is a larger version of the one commissioned by the Nottingham Playhouse in 2001. The original cost £900,000 and was to date the most expensive piece of civic art funded by the United Kingdom’s National Lottery. New York’s Sky Mirror stands nearly three stories tall at the Fifth Avenue entrance to the Channel Gardens at Rockefeller Center. 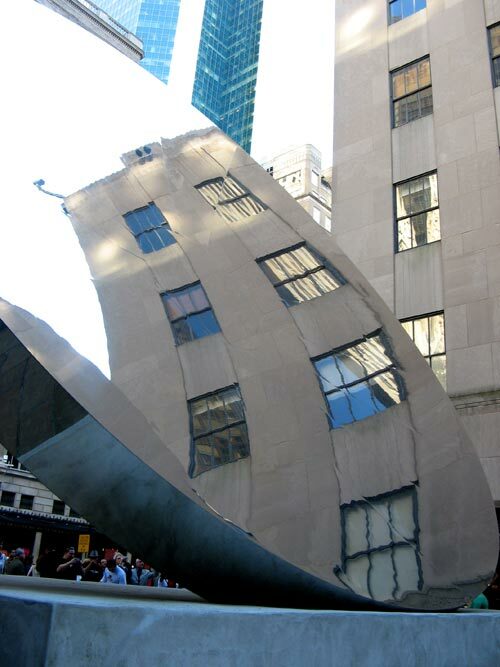 The concave side of this circular stainless steel sculpture is angled upward, facing 30 Rockefeller Plaza, reflecting an upside-down image of the skyscraper. 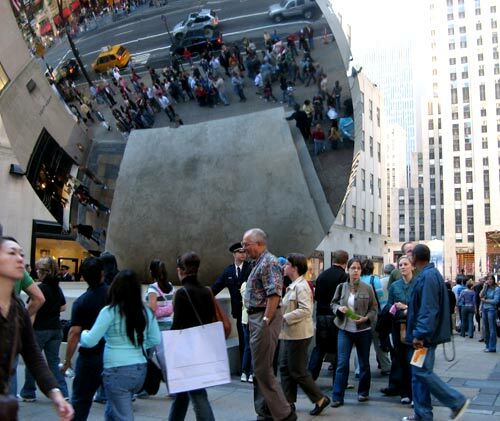 The convex side, facing Fifth Avenue, reflects the mostly tourist crowds gathered, posing, snapping photographs or just staring, entranced by the passing streetscape. 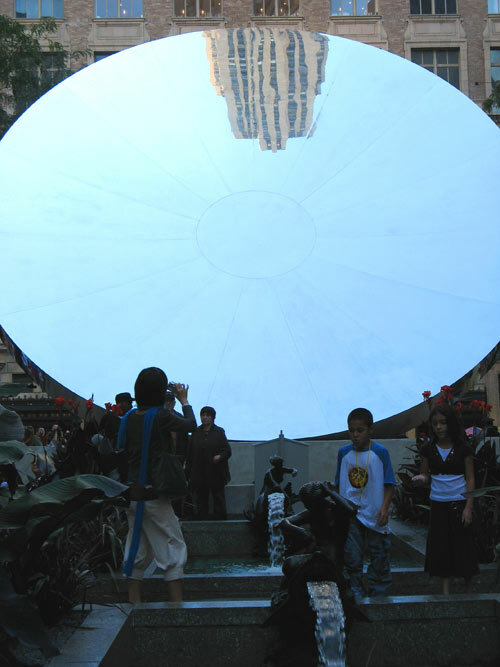 Sky Mirror is on view at Rockefeller Center through October 27, 2006. Dinner party went well: I met CS just outside my apartment, so she and I could travel into Queens together. AC, JL and of course, our hosts HYB and SYB, were also assembled, and the six of us shared deeply buttery filet mignons, cheesy baked squash gratin and chunky mashed potatoes with leeks. 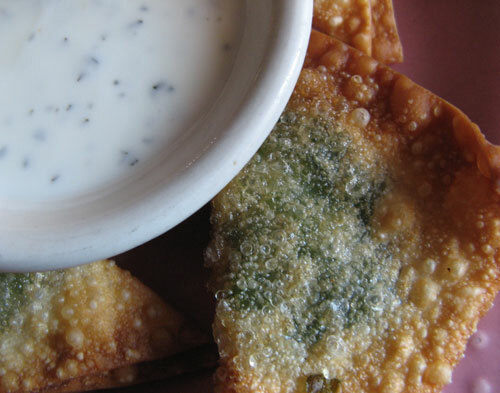 All organic vegetables, fresh from our farmer. AC, CS and I bonded over dark chocolate-dipped strawberries. The girl talk may have proved too much for JL, who escaped, claiming calculus homework, and HYB, who retired to his room, shortly after the meal. We arrived just in time for our reservation at the lobby of The Carlton Hotel. Didn’t matter, really, as OHNY wasn’t turning people away, despite the arrival of several more than the printed limit of 25 people for the architect’s tour. 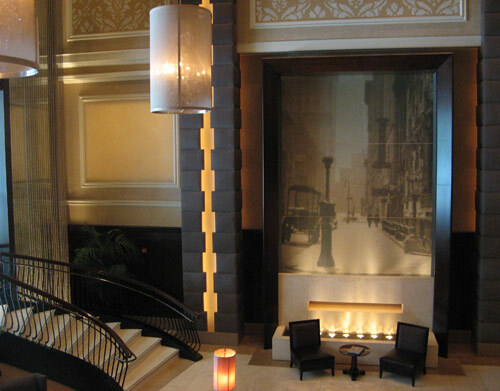 The Carlton on Madison Avenue was restored by renowned architect, David Rockwell of the Rockwell Group. 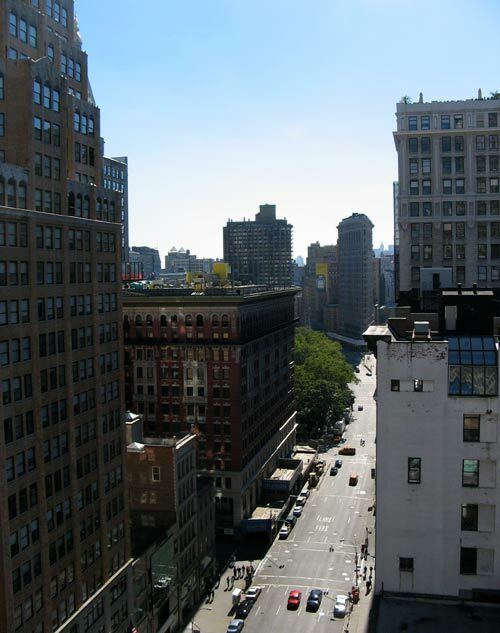 Other historic New York City hotel projects have included the W New York and the W Union Square.) 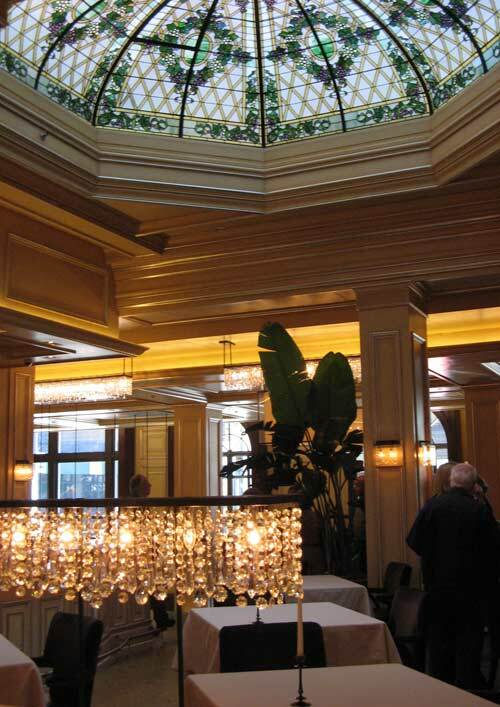 This graceful 1904 Beaux-Arts landmark hotel had grown considerably shabby over the years. During the course of the extensive five-year $60 million dollar renovation and restoration program, workers uncovered this extraordinary 30-foot 1911 Tiffany-style glass dome and original terrazzo mosaic tiled floors — both almost entirely intact, but remarkably hidden under years of soot and grime, accumulated during the space’s prior incarnations. 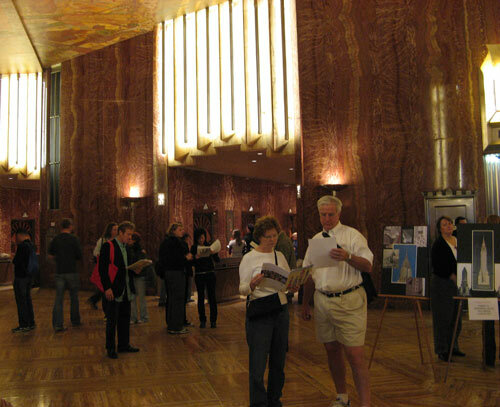 Added during the renovation: large-scale water wall in the three-story lobby. Distinctively modern frosted glass walkways were installed by Rockwell, around the perimeter above. On to OHNY 2006 stop #4: P.S. 260, which, despite its name, is not a public school, but a penthouse film-editing studio. The site was primarily notable for its roof deck and striking views. 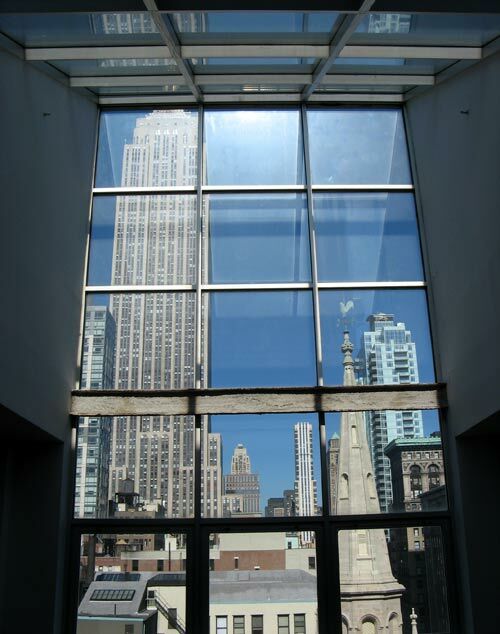 Here, the dramatic glass walled entry: that is, of course, the Empire State Building, looming large, on the left. The view down Fifth Avenue to the triangular Fuller Building, better known as the Flatiron Building. A short walk from P.S. 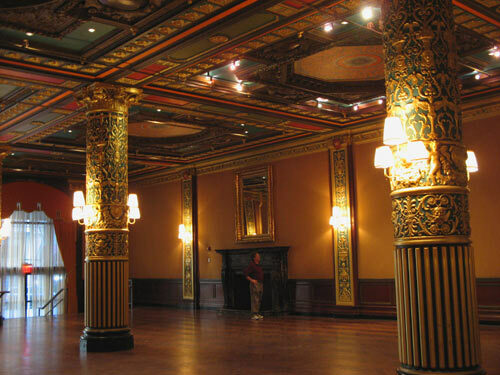 260, our fifth stop: The Prince George Ballroom, located inside the storied landmarked Prince George Hotel, part of the Madison Square North Historic District. 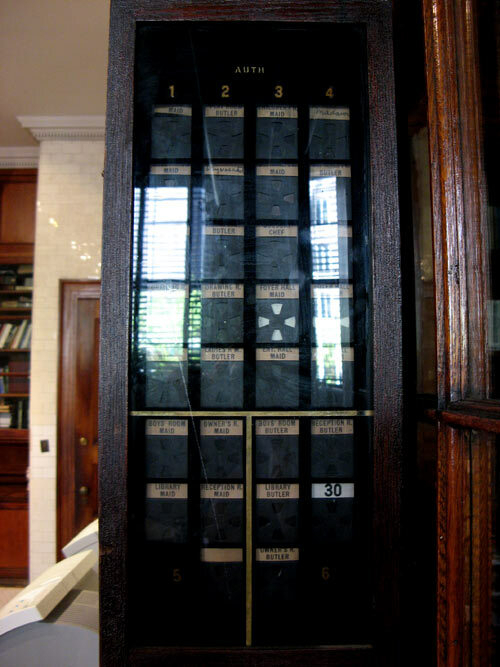 The 14-story Prince George was built by architect Howard Greenley in 1904 as an exclusive residential and tourist hotel. By the mid-1980’s, it was the country’s largest homeless shelter for families. After decades of decline, the site degenerated into one of New York City’s most squalid, crack-infested welfare hotels. After a 1987 court ruling, the city closed down many welfare hotels, including the Prince George in 1990. The site remained abandoned until 1997, when it was purchased by pioneering housing and community development organization Common Ground Community. 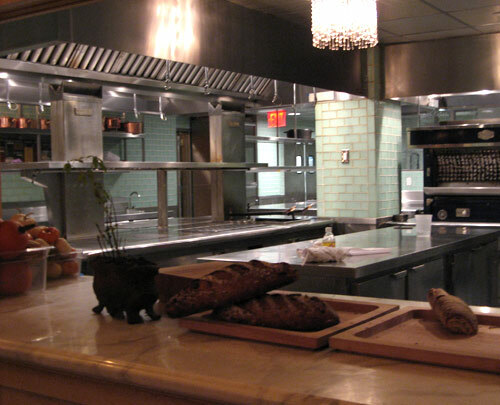 The Manhattan nonprofit took over the space to create and manage permanent, affordable housing for low-income and formerly homeless adults.The renovation was spearheaded by Beyer Blinder Belle, the same architectural firm that did the Grand Central Station terminal renovation and The Rubin Museum of Art conversion. The project took over three years and cost $48 million, half of which came from low-interest loans funded by the state and the city. The hotel rooms were reconfigured into 416 studio apartments; over half of the residents are living with a special need, such as mental illness, HIV/AIDS and/or a history of substance abuse. With an average annual operations cost of about $12,000 per apartment, the Prince George is the most cost effective form of supportive housing (e.g., shelters, jails, hospitals, psychiatric wards) in New York City. 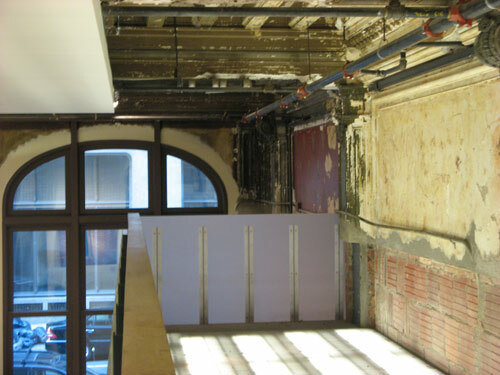 In 2004, Common Ground set about restoring some of the building’s former common areas. 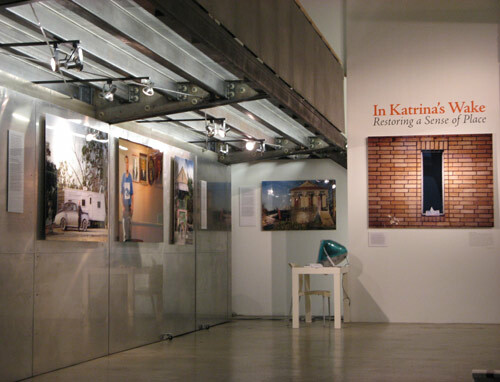 Working with four other non-profit groups, the organization arranged for at-risk youth, high school students interested in restoration arts, architectural students, and individuals with HIV and AIDS to work on the renovation, offering both job-training and jobs. 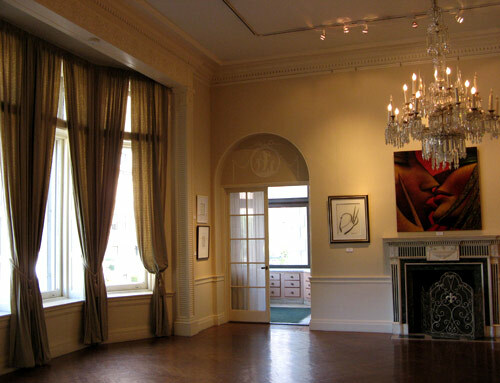 Students from Parsons designed and built the entry foyer and gallery space in what had been the Prince George Hotel’s “Hunt Room.” The result: the modern and airy World Monuments Fund Gallery at the Prince George, currently exhibiting “In Katrina’s Wake: Restoring a Sense of Place. Photographs by Stephen Wilkes.” The Gallery’s sleekly minimalist design highlights the building’s architectural past — and in fact: one upper section was purposely left raw and unfinished, as a reminder of the lobby’s original state. 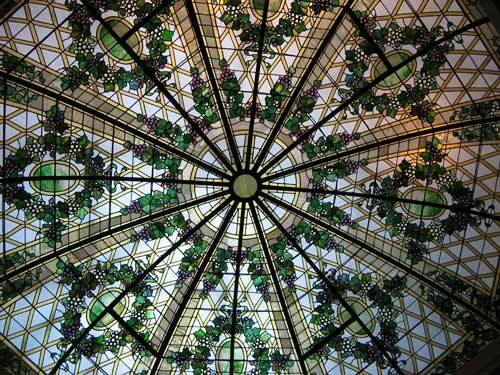 The jewel of the restoration is the 5,000 square foot Prince George Ballroom. 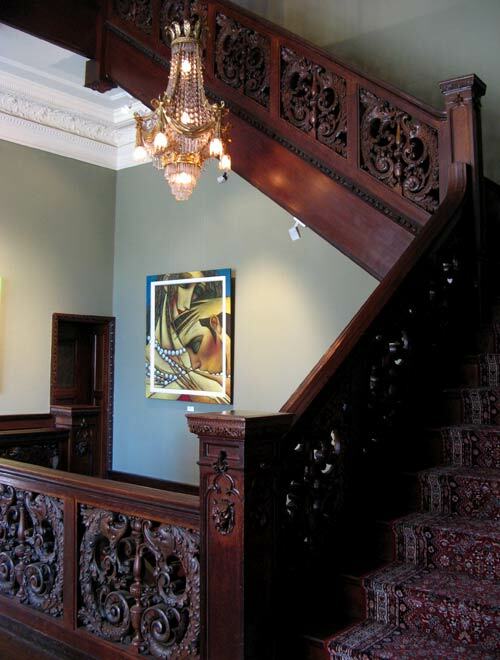 Rich with intricate neo-Renaissance gilded plasterwork, elaborately muraled and ornamented 18-foot coffered ceilings, herringbone oak floors, and a striking black marble mantle. Staff from the Alpha Workshops, which provides training and employment in the decorative arts for people with HIV and AIDS, restored the original water-damaged plasterwork and paint, and provided hands-on training to groups of students from the Brooklyn High School of the Arts, YouthBuild USA and The Christopher, Common Ground’s facility for young adults. We emerged into the bright sunlight from the pleasantly disorienting (de)tour of the Ramble, and exited the East side of the Park on 79th Street, at the Metropolitan Museum of Art. At the intersection, we paused to admire the stunning French Renaissance limestone mansion across the street: a regal, lacy form of ornate arches, Gothic moldings, high mansards and fantastical pinnacles. I gazed up, fantasizing about who would live in such a grand house. As we turned the corner, en route to the Lexington line, we discovered that the current occupant of the mansion is not an extremely wealthy family, but, in fact: The Ukrainian Institute of America. Their website has some fuller images of the mansion exterior in all its glory. 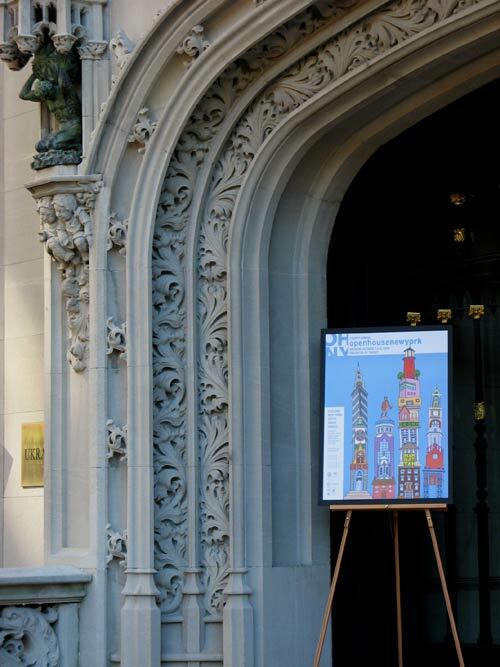 As serendipity would have it, the UIA was also a participant in the openhousenewyork weekend: “America’s largest architect and design event,” opening doors around the city for the fourth year in a row. The Fletcher/Sinclair mansion was purchased by oil industrialist (and Teapot Dome scandal-ridden) Harry F. Sinclair in 1920, and in 1930 was taken over by eccentric bachelor and recluse Augustus Van Horn Stuyvesant (the last direct descendant of Peter Stuyvesant to bear his surname.) 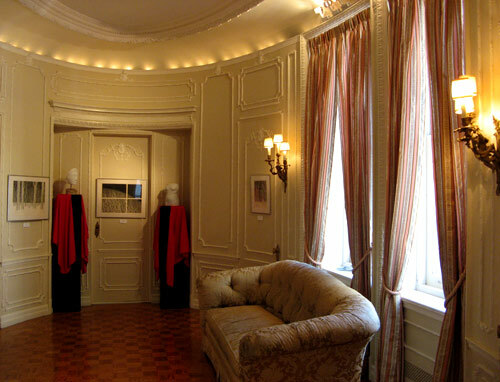 In 1955, the mansion was purchased for use by the Ukrainian Institute of America corporation by William Dzus, prominent Ukrainian inventor, industrialist, philanthropist and founder of the Institute. After a brief stop for breakfast sandwiches at the nearby Hot & Crusty, we hopped the 6 down to Grand Central, to hit stop #2 on our OHNY 2006 tour: the world famous Chrysler Building. Despite passing by too many times to count, I’d not actually set foot inside this landmark in perhaps 15 years. Long considered one of New York City’s most glorious and distinctive skyscrapers, The Chrysler Building, on Lexington Avenue at 42nd Street is a famous example of Art Deco architecture. 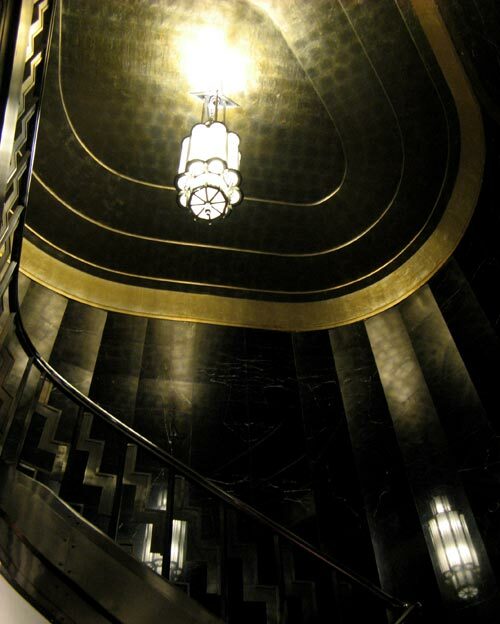 It was completed in the Spring of 1930 for the Walter P. Chrysler car manufacturing company. 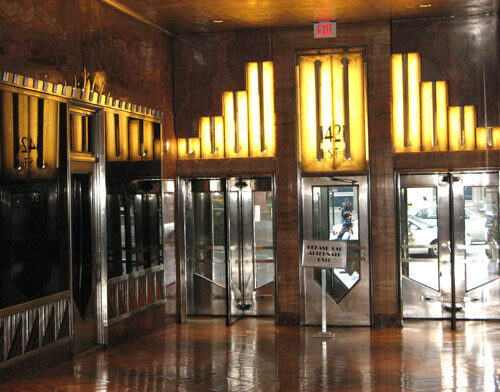 The distinctive ornamentation (most notably: the famous hood-ornament eagles, whose sleek heads extend from eight corners on the building’s 61st floor) are based on features that were then being used on Chrysler automobiles. Most people are familiar with at least some of the interesting history of the building: how Brooklyn-born architect William Van Alen found himself in ardent competition with his former partner, H. Craig Severance (architect of the Bank of Manhattan at 40 Wall Street), for top “World’s Tallest Building” honors; how the matter was settled definitively in Van Alen’s favor when he erected his secret (and secretly pre-assembled) weapon in just 90 minutes on October 23, 1929: the 27-ton, 180-foot sunbursted steel spire; how the building held the “World’s tallest” title for just a few months before the Empire State Building surpassed it. No need to retread much here. Ultimately, the construction of the Chrysler Building ended being more a curse than a boon for its architect. Most critics scorned the building as a gauchely oversized vanity project with little architectural merit. And by the time the building was officially opened on May 27, 1930, Van Alen himself had run into serious difficulties: accusations of corruption and contractor bribery and, much worse, a bill dispute with Chrysler, who refused to pay his full, percentage-based, fee. 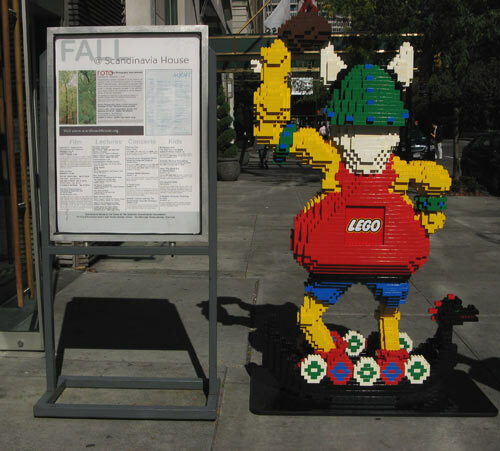 It was only after a lengthy court battle that Van Alen managed to obtain sufficient compensation. Although history would immortalize Van Alen for his masterpiece, he had lost his good reputation as an architect and never worked on a notable commission again. 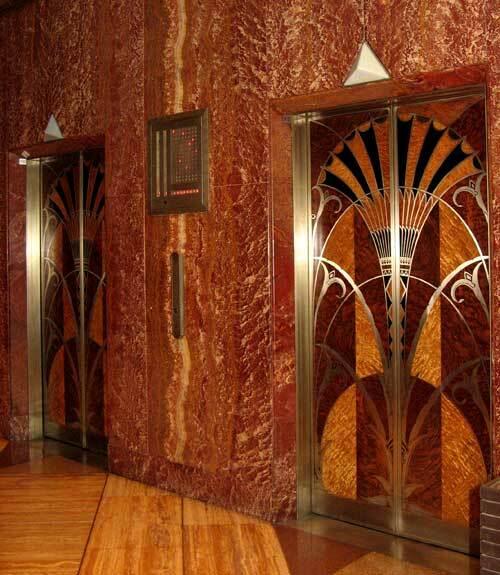 The building no longer maintains a public viewing gallery on the 71st floor, but we were allowed to wander around the stunning 3-story triangular Art Deco lobby with its lavishly decorated with polished Red Moroccan marble walls and multi-hued marble, travertine and onyx floors. 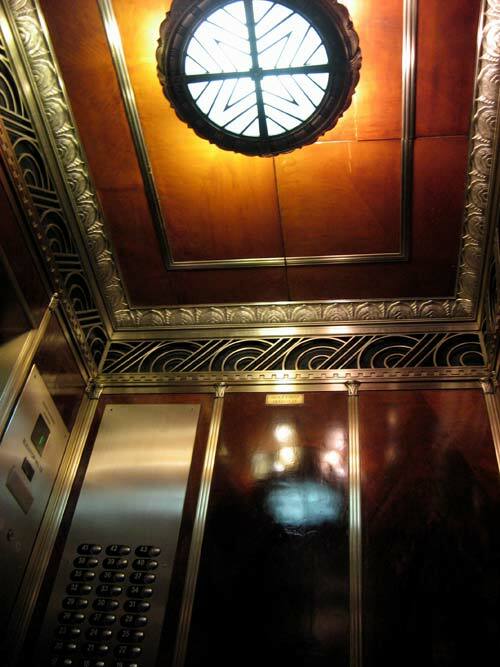 All of the building’s 32 elevators are lined in a different pattern of wood marquetry, using eight varieties of wood from four continents. 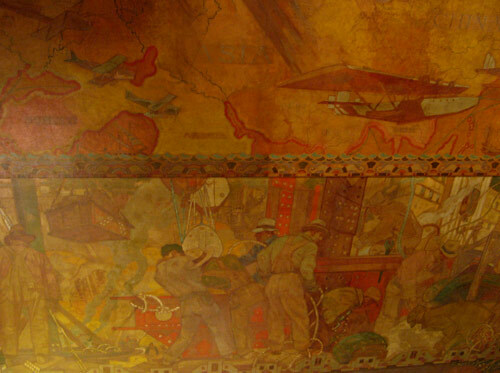 Detail of the elaborate ceiling mural, “Energy, Result, Workmanship and Transportation,” painted by Edward Trumbull. At some 70 by 100 feet, it was the largest in the world upon its completion.